Hello, friends. It has been nearing two months since my last thing here – I managed to miss the new-year’s tidal wave of blog posts, and then some, but am finally getting around to catching up. Having also renewed the domain for another 12 months, I thought it was high time to break my no-post dry spell. I’ve found it challenging to keep up with blogging this past while. The last few weeks have seen me a little blocked up – it’s been hard to find my yarn-fingers (the knitter’s equivalent of sea legs) and my words. Even my gouache colours have been lying dormant and unsqueezed in their travel-toothpaste-sized tubes. After some attempts at forcing a few creative Starts — a bright orange alpaca hat that came out too small, a garment-unravelling project that hit a snag and stayed there — I’m deciding to get friendly with this period of creative dormancy — to stop trying to fix it, to let it be, and maybe even get acquainted with it. As I’ve written in past posts, The Block is no stranger in these here parts. My projects have often followed this logic and sequence: there’s the dizzying dream of making something new, the hours of research; brow-furrowed exertion melds into hyperfocus (the sweet spot and superpower of creators! ); acuity grows with repetition and concentration, but unfortunately, so does fatigue; the arc of work winds down; soon, I find myself not just tapped out, but feeling a bit like the bikes I’ve seen around town, tethered in place and missing a wheel (am I the only one who likes to imagine the complex emotional worlds of bicycles?). I also take stock of projects past, reminding myself that Pauses are temporary guests and not year-round roommates. When I think back on my creative journey of 2018, I remember that it was a great year, full of firsts, milestones, growth, and giving — a very first colour-work garment (yay! ), breaking into lace in a big way, doll-making experiments, and knitting up a good amount of baby-things and gifts. It was a year of giving away and keeping the learnings. It was a solid year. 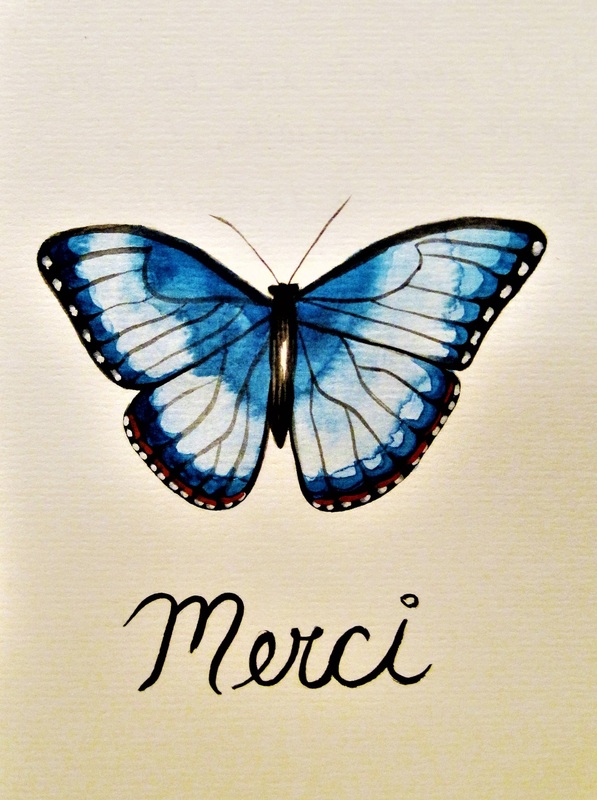 In that spirit, I pulled this little blue butterfly out from my 2013 watercolour archives — I chose it as if to say “Merci” to 2018 for all the good things, and to lift a little wing for the flight ahead. Thanks, Tess. I love that – “soft pause” puts it perfectly. I hear you – January does a number on me every time, too. Something about my island roots makes me long for palm trees, tropical fruit, and green fields. 🙂 I wish your groove a smooth comeback and some sunny days in the mean time. Happy New Year to you, too! And bravo on a prolific 2018 full of gorgeous knits! Thank you kindly, Mariss, for your kind and thoughtful comments. Happy 2019, and wishing you another year of prolific stitching! Finally, you have come out of your cocoon and morphed into a beautiful blue butterfly spreading its wings to phase out some pauses in life and dust the cobwebs. Happy New Year! Hey Shirley! I know all too well about the doldrums of project snafus! I love that looking back on 2018 is a positive and motivating thing–you certainly accomplished a lot. That said, my good friend Traci (who manages a farm in town) has told me many times that nothing produces all the time and that fallow fields yield the best results in the next spring 🙂 Rest is good and breaks can be creatively refreshing. Wishing you the best for this new year–whatever that may be! Hi there, Shirley, so nice to read your insightful post. I have been feeling the same, and noticed the list of daily reads from my blog roll has greatly reduced these past few weeks. I think there is something in the air, and it is not only the cold. Something that makes us feel tired or despondent, as if something is brewing but we don’t know what, and making a step forward seems uncertain and possibly dangerous. I too have not produced much, and my knitting has slowed. Well it is winter, time for rest, pause and reflection. Or maybe a collective urge to slow down. To start anew when we will be ready. Thanks for your comments, Agnès. I’m sorry to hear that you’ve been experiencing this thing, too. Your description is vivid and true to life, and the possible ‘danger’ is on point – my favourite things have been covered with “prickles”; I can’t wait until these strange prickles go away. 🙂 In the meantime, I wish you a Happy New Year full of new knits and adventures in colour, and send along a big bravo for all of your truly gorgeous FOs of 2018! Sorry you loss your “yarn fingers” (very creative description!) and were feeling blocked. You are such a great writer and I like this phrase “Pauses are temporary guests and not year-round roommates.” I am glad the Pauses have not shown up with a U-Haul, they are just those guests that stay longer than three days (remember the saying that fish and house guests start to stink after 3 days – ha!) . The blue butterfly is beautiful! Oooh I love this post. You have an incredible way of writing, and sharing your experience. I don’t know if this is something you’d find helpful, I’m doing coaching now (which you may know). And I’m moved to offer you a session. This would be a gift to you! No strings at all. Just because you’re amazing. If you’re inspired, touched, or even curious 😊, email me ar weloveyou@forgivingconnects.com and we can talk more. I hope you take this with the genuine caring that I’m sharing this with! Totally from my heart to yours. Let me know either way. And if not, that’s entirely fine. That is so great Shirley!! Good luck with your consult with a coach. How supportive of you and your heart-felt intentions – love that you’re doing this. ❤ Blessings to you. 🙂 You are welcome to let me know how it goes, and know that I'm cheerleading you every step!! I fell so far behind with posts over Christmas/new year, I’m *still* catching up! Likewise, Hannah. 🙂 Lovely to see the new WIPs you’ve been working on. The Kalinda shawl is a gorgeous splash of colour!